History has shown that emerging great powers and established or declining great powers are likely to fight major wars in order to determine the balance of power in the international system. 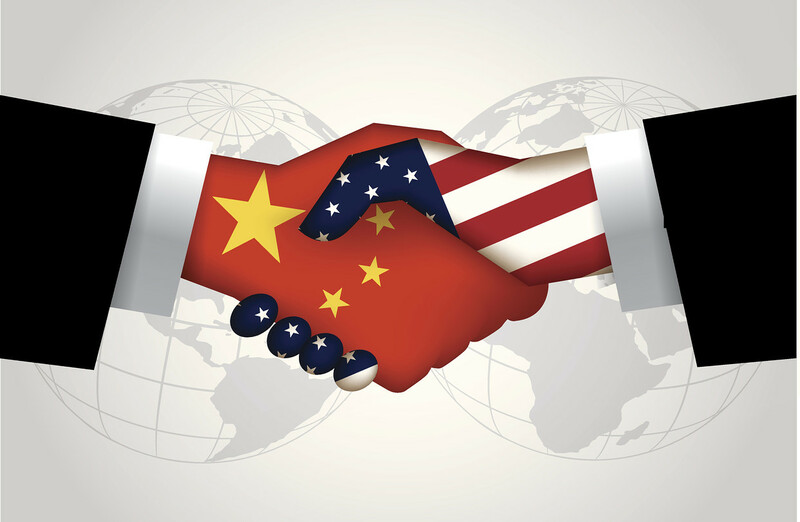 There is considerable fear that the U.S. and China are heading towards great power conflict. As Christopher Layne argues, there are “several important — and unsettling — parallels between the Anglo-Germany relationship during the run-up to 1914 and the unfolding Sino-American relationship.” The headline-grabbing dispute in the South China Sea offers an excellent example of one of the several flashpoints that could spark a larger conflict between the U.S. and China. But the probability of great power conflict between the U.S. and China can be reduced if the two states can find ways to better manage interactions in flashpoint areas. The oldest flashpoint, and the area most important for Chinese domestic politics, is the Taiwan Strait. In 1972, the Shanghai Communique stated that the so-called Taiwan question was the most important issue blocking the normalization of relations between the U.S. and China. This question has yet to be solved, mostly because Taiwan has been able to deter attack through a strong indigenous defense capability backed up by American commitment. 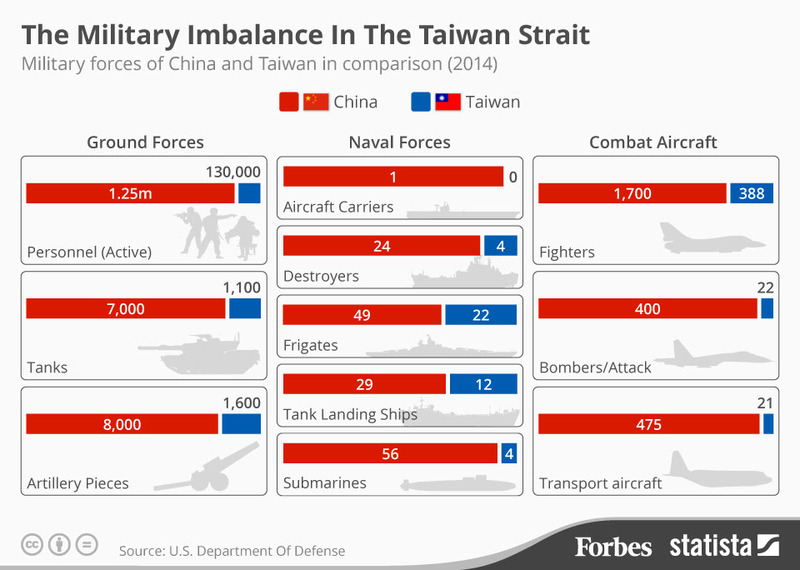 Military Balance in the Taiwan Strait, Forbes. The status quo in the Taiwan Strait will be unsustainable as China continues to improve its military capabilities and adopt more aggressive military strategies. If the U.S. wants to avert a war with China in the Taiwan Strait, it must start looking for an alternative to the status quo. Taiwan’s strategy of economic accommodation with China under the Ma Ying-jeou administration has brought about benefits. The U.S. should encourage Taiwan to deepen its military and political accommodation with China. This would be a difficult pill for Taiwan to swallow, but it could offer the most sustainable deterrent to armed conflict in the Taiwan Strait. For years, Taiwan’s de facto independence from China has relied on a qualitatively superior, defense-focused military that could prevent the landing of a large Chinese force on the island. The growing power of the Chinese military, especially its naval and missile forces, has begun eroding this qualitative advantage. Indeed, some observers have already concluded that “the days when [Taiwan] forces had a quantitative and qualitative advantage over [China] are over.” Taiwan still possesses a formidable military and could inflict high costs on an attacking Chinese force, but ultimately American intervention would likely be necessary to save Taiwan from a determined Chinese attack. Military intervention by the U.S. on the behalf of Taiwan would be met with formidable Chinese resistance. China’s anti-access/area denial strategy complicates the U.S.’s ability to project power in the Taiwan Strait. China’s latest maritime strategy document, released in May of this year, states that China’s navy will start shifting its focus further offshore to include open seas protection missions. Such a shift implies an aspirational capability to keep intervening American forces away from Taiwan. American political leaders have not given up on Taiwan, and the 2015 U.S. National Military Strategy places a premium on reassuring allies of America’s commitments. However, the fact that China’s improving military capabilities will make an American military intervention on behalf of Taiwan more and more costly must not be ignored. 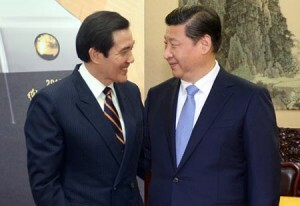 Ma Ying-jeou and Xi Jinping, Xinhua News Photo. If Taiwan is serious about accommodation as a means of deterring military conflict, then it should cease purchasing military equipment from the U.S. Stopping the arms purchases would send a clear message to Beijing that Taiwan is interested in deeper accommodation. A halt in arms sales would also benefit U.S.-Chinese relations by removing a “major stumbling block for developing bilateral military-to-military ties.” This is certainly a very controversial proposal, and would likely be very difficult to sell to the Taiwanese people, but as I’ve already explained the status quo is becoming more and more untenable. There are two important things to keep in mind about this proposal which mitigate fears that this is some kind of appeasement to China. First, halting U.S. arms sales does not mean that Taiwan’s self-defense forces would cease to exist. China may be gaining ground on Taiwan militarily, but the pain that Taiwan could inflict on an attacking force is still high. China may be able to defeat Taiwan in a conflict, but the losses its military would take to seize the island would significantly hamper its ability to use its military while it recovers from attacking Taiwan. Second, there is an easily identifiable off-ramp that can be used by Taiwan if the policy is not successful. Stopping arms purchases is meant to be a way of testing the water. If the Chinese respond positively to the decision by offering greater military cooperation with Taiwan or some form of political concessions then Beijing signals its commitment to the accommodation process. On the other hand, if the Chinese refuse to follow through and meet Taiwan halfway then Beijing signals that it is not actually committed to accommodation. Taiwan would then resume purchasing American weapons with the knowledge that it must find some other way to prevent conflict. Accommodation by giving up American arms sales is a tough pill for Taiwan to swallow, but it simply does not have many other viable alternatives to preventing conflict. Taiwan could pursue acquiring nuclear weapons, but this would be met by American opposition and would likely trigger a pre-emptive attack by China if the weapons program were discovered. Taiwan could try to avert conflict by increasing military spending to forestall, but this would be difficult to sustain so long as China’s economy and military spending is also growing. Analysts at CSBA have argued for deterrence through protraction, which advocates employing asymmetric guerrilla-style tactics to prevent China from achieving air and sea dominance. This has the highest likelihood of success of the three alternatives mentioned in this paragraph, but it still relies on intervention by outside powers to ultimately save the day. Taiwan’s military deterrent will not be able to prevent a Chinese attempt to change the status quo by force for much longer. Any conflict in the Taiwan Strait would likely involve a commitment of U.S. forces and could lead to a major war between the U.S. and China. Accommodation could be the best worst option that Taiwan, and the U.S., has for preventing a war with China. Announcing an end to American weapons purchases could bring Taiwan progress on negotiations with China if successful while still providing off-ramps that Taiwan could take if unsuccessful. I admit, the idea of accommodation does have its flaws, and more work needs to be done to flesh out this idea. I hope that this idea of deep accommodation will add to the discussion about the management of the Taiwan Strait issue. The status quo won’t last forever, and a vigorous debate will be needed to arrive at the best possible solution. Eric Gomez is an independent analyst and recent Master’s graduate of the Bush School of Government and Public Service at Texas A&M University. He is working to develop expertise in regional security issues and U.S. military strategy in East Asia, with a focus on China. He can be reached at gomez.wellesreport@gmail.com. Bitter pills are always easier to swallow when they’re in someone else’s throat eh? The people of Taiwan do not want to live under Communist Chinese rule. Do you sacrifice their freedom in order to prevent war? Would any other country willingly do the same? Deep accommodation to appease China seems a poor choice in the long term, as appeased powers tend to hunger for more rather than maintain any status quo. British prime minister Chamberlain would agree with you on that, a deep accommodation with the Nazi Germany – “peace for our time”, led to a war and a most horrific period of human history. Author stated purchasing arms by Taiwan is unsustainable because China continue improve its military capability. I see this simply a arms race during the cold war and it can go on for a while. Also, invasion of Taiwan may unravel the communist regime altogether. Why is CIMSEC providing a platform to a recent college graduate with views consistent with Chinese Communist Party propaganda? The author is advocating Congressional amendment or revocation of the Taiwan Relations Act, although he presumably doesn’t realize it. The TRA is the foundation for US relations with Taiwan. The TRA calls for provision of necessary defense articles and services and “maintaining the capacity” to resist PRC use of force and other forms of coercion. The former clause is straightforward. The latter means that a Taiwan scenario should be the basis for deliberate US military planning. As US law, the TRA takes precedence over the Three Joint Communiques, which are US-PRC statements of policy. Eric Gomez makes no mention of US legal provisions contained in the TRA. He only references the Three Communiques (specifically the 1972 Communique). This is standard CCP propaganda doctrine, which is part of a broader political-military campaign to undermine US support for Taiwan and its democratic system of government. The author probably doesn’t understand these nuances. CIMSEC should though. Beyond this, the Obama administration hasn’t notified Congress of any new arms sale to Taiwan in four years. This is the longest gap since the shift in US diplomatic relations from the ROC to the PRC in 1979. How much more accommodating can we be? CIMSEC recognizes that people have differing opinions and that it is instructive that they be aired for debate. We don’t restrict our articles to only those we agree with. Sometimes, the best articles can be ones people strongly disagree with, that forces the opposing argument to ride out in response. We wouldn’t be any fun if we were just an echo-chamber. Now, you have the makings of a good article on the US legal commitment to Taiwan here – one you’re right that many don’t know of or understand (and worth bringing in the aspect of WHY this act exists). Many people assume our relationship with Taiwan is just one of preference and strategic calculation, not just law. Consider writing a piece for us that lays out the fundamentals of the TRA construct it’s context in the aftermath of the PRC’s recognition. Final thought. The picture of President Ma Ying-jeou and CCP Secretary General Xi Jinping is a well-crafted photoshop job. It’s attributed to the Xinhua News Agency. The two have never met in person before. The PRC makes no accommodations as they advance heir National Strategy resembling the Game of Go. They encircle and then remove the captured within. Make no mistake, the foolish release of the their three expanding areas define fro the time being the borders of the game The last line goes well east of Taiwan. It resembles, interestingly the 1941 boundaries of the Greater East Asia Co-Prosperity Sphere. The future economic strength of the PRC relies on a continuing flow of raw materials across both the Indian and the Pacific Ocean. It may control now its own littoral and the South China Sea. It does not yet control the passageways into or out of that body of water. The problem is any US conventional or nuclear attack on mainland China will trigger PLA retaliation.Te conus and US bases are no more immune and out of bounds to Chinese attacks. The Chinese need not take over Taiwan physically. The threat to destroy the island will be such a strong deterrent without actually doing it will cause the Taiwan economy to go into a downward spiral. The US still has massive military dominance over China.The problem is will the US be willing to trigger ww3 shd Taiwan come under attack. This is 2015 not the 50s or even 5 years ago. Then US carriers were such an intimidating presence that the PLA were unable to do anything. Things have changed.For starters the PLA may have the carrier busting missile in operation.That could be a big threat According to the pentagon,the destruction of a single carrier will cause the US to escalate to nuclear war. Taiwan’s fate will be decided by Washington and Beijing. There is nothing the Taiwanese can do about it. History is full of examples of big powers deciding the fate of minor countries. 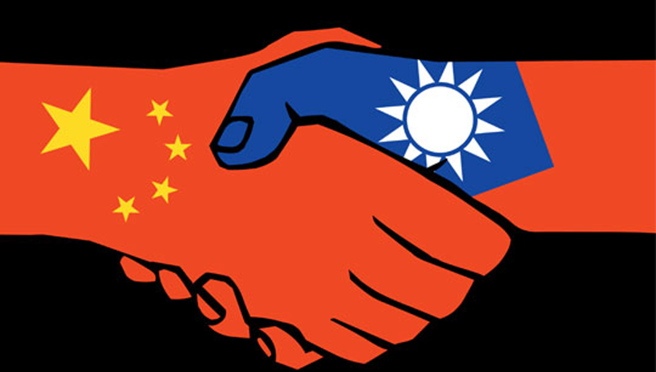 Taiwan is an internal affair of China’s. The TRA is obsolete. What would the US do if China has a law against police brutality in California. It’s utter stupidity.China had no choice but to agree to this piece of legislation to normalize relations with the US in Carters’ Presidency. Short of stationing US forces/US nw in Taiwan,the island wont be able to defend itself. As said the PLA need not physically take over the island.The threat to blow it up is such a strong deterrent to independence that even the most die hard independence minded would have to bow to. What shd the US do in such an event? Launch anuclear attack on China?Since China has nw and can retaliate,I doubt it. You never know .Since China is so huge,the US maytry to start ww3 to dismember it. There are such theorists in the US policy making circle.Even if Tsai is elected President she will have acknowledge that Taiwan’s room for manouvre is restricted.The best option is to carry on with the current status .Eventually it would have to be part of China. In what form form,nobody knows.